This is like the 9th art trade I've done with BlueFairy, hopefully she still likes it even though my scanner decided to destroy the quality. Also the drawing was too big so I couldn't scan the bottom oh well, at least the cat looks good. Really, I didn't think that could ever be possible, hehehe thank you. 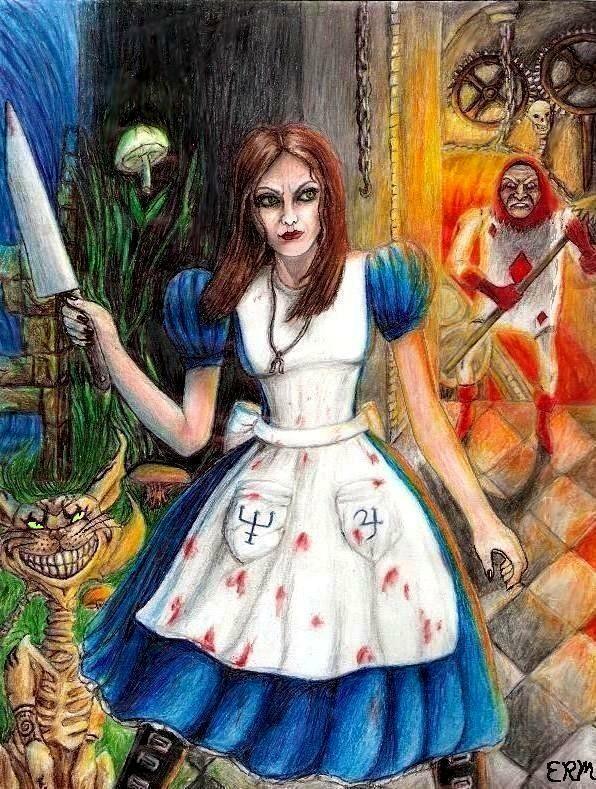 An evil Alice nice... Love the cat and the detail on Alice! I played that game! (Very warped...) I love how you drew the Cheshire cats' evil grin, and made him look all bony and gaunt! Yeah if I wouldn't have included Cheshire, it would of been a crappy drawing hahaha, anyway thanks so much for the comment! oh wow! indredible details. shoot.. who's godlike now?? wow. Why thank you, and I agree it is a great game, you know I heard a long long time ago that they were going to make a Red Riding Hood game too, I wonder what happened to that. red riding hood? i thought it was the wizard of oz? OMG i can't wait 2 see da movie! YEAH ME TOO, do you know when that's coming out? And really Wizard of Oz, where did you hear that?